TLDR; Showcase IDX Listing Detail Pages and Hotsheets are pre-rendered on your WordPress server and the IDX content appears to search engines as native HTML content, because it is. The plugin also lets you customize all the things you’d expect to customize, like page titles, meta descriptions, and listing page URL structures. SEO is not an afterthought. When talking about SEO, we always like to start with our high-level approach, because these tenets are what we have built our SEO strategy around and underlie all of our SEO decisions. It’s valuable to get out of the weeds and look at what Google, in particular, is trying to achieve. Google is only valuable to users (and therefore profitable) if its users get the most relevant results using it. Everything we do in terms of SEO has to be looked at through this lens. What you show Google on your website has to be authoritative, cohesive and relevant. Search engines like Google and Bing are constantly changing the indicators they consider and their corresponding weights in an effort to rank content and provide the best, most relevant results. You can chase these changes, but there are some generally accepted best practices that we follow to ensure that our IDX adds value to your website in terms of SEO. We built Showcase IDX around these best practices. We know that this approach is different from other IDXs out there, but once you’ve seen what we do, we think you’ll really like it — and the results it gets you. To start, we’ve deeply integrated our IDX into the WordPress platform while respecting the WordPress codebase and processes. Before we get into the details of our SEO strategy and implementation, we should probably say up front that we don’t use iFrames because they are garbage and don’t index at all. We also don’t use subdomains or other domains/websites to host your search pages. The links to the listing pages from these hotsheet results are real HTML “A HREF” links. There is no dynamic loading whatsoever from hotsheet results, just standard links to listing detail pages that are, in turn, pre-rendered in the same manner as the hotsheets to make them accessible to search engines. Listing Detail Pages are generated in the same way as hotsheet content, except your WordPress server interprets the URL information instead of a shortcode to generate the correct listing detail HTML content. An XML Sitemap URL is automatically generated for every individual website in your Showcase IDX account. It can be found in your SEO settings page. We highly recommend that you submit your XML Sitemap to Google through your Google Search Console. 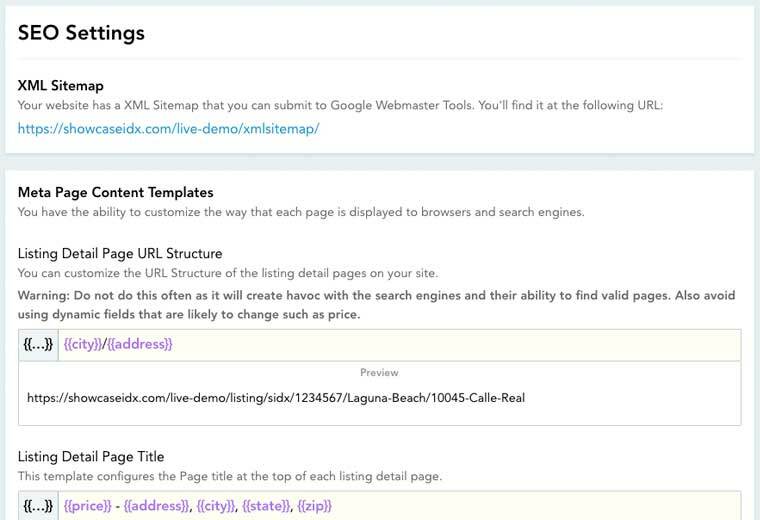 Your XML Sitemap contains a complete index of all the listing detail pages available on your website at any given time. This sitemap is updated continuously as we add/edit/delete listings from the MLS. So for an MLS, we have on a 10-minute update cycle, this XML Sitemap has the potential to be automatically updated up to 144 times a day. This would be rare, but it could happen based on MLS activity in a 24-hour period. Showcase IDX lets you customize a number of elements for your listing detail page: URL template, page title, and meta description. You can add a combination of dynamic and static elements to these to create your own custom versions. We do not support custom Meta Keywords, as Google has been pretty clear that they don’t do anything anymore and they are used extensively in keyword comparison and marketing tools. Showcase IDX was built to work alongside popular SEO plugins, like Yoast, right out of the box. There are other factors that go into being highly indexable beyond customizing URLs, page titles, and meta tags. Page Load Time is also exceedingly important, and we’ve made every effort to reduce page payload size and the number of separate server calls to ensure that the page loads as fast as possible. This is something that we’re always optimizing. The other big thing that a lot of people don’t really talk about is the Bounce Rate, which is the number of visitors who leave your website after only viewing one page. This goes back to Google’s main goal: providing useful results. To this end, we’ve designed our listing detail pages to load fast and be instantly engaging. We put big photos, the listing history, and saved search above the fold on many screen sizes and made everything work and look great for those viewing your site on their phones. Our goal is to show your visitors instant value and to engage people on your site as quickly as possible — decreasing the chance of bouncing and increasing the chance that your visitors will sign up. IDX is a key part of your website’s SEO profile, but it is by no means the only factor that dictates your SEO success or failure. Often, when we see sites underperforming, it’s because non-IDX factors are damaging the website’s ranking and indexability. We are not trying to pass the buck when we say this, it’s just the truth. We understand the IDX’s key place in your long-term SEO strategy, but to get the best results, your SEO strategy cannot rely solely on IDX content in today’s congested and competitive search engine landscape. Only 12 organic results make it to the front page for most searches. The competition for these spots is unbelievably competitive. It takes some work to get to the front page. Right now, it’s too early to say exactly how well this SEO strategy is going to perform since our IDX platform’s latest version is so new. Frankly, we need more feedback. That said, as we’ve laid out in this post, our approach and careful use of best practices gives us confidence that it will do well for our customers. It’s also important to understand that this is just the first release with our new SEO strategy. We built our platform’s architecture to be flexible and easy to refine, so expect more improvements as we get past the many, often-conflicting views of what makes an SEO strategy effective and can make more data-based decisions. We will continue to listen to all of our customers’ viewpoints (there are many when it comes to SEO) and ensure that we make the best decisions possible regarding SEO. In terms of real estate websites with IDX listing content, a 404 is most often seen when Google indexes a listing page and then tries to check/reindex that URL, and it is no longer in the active MLS feed. For most real estate website and IDX platforms, this means that the URL is no longer going to go to an active, valid listing page on your website. When this happens your server should respond with a 404 error code. This just means that your server is telling Google or a browser that this page no longer exists, nicely.